played on Tuesday, 20 September 2005 at 7.45pm. Altrincham came within four minutes of winning this game before a superb long shot by Nicholson came back off the Alty bar and was turned in by Scarborough substitute Coulson. Alty had taken the lead after 58 minutes when Colin Little's shot was saved by Walker only for the Alty striker to poke home the rebound. It was Alty's first game in almost six and a half hours of league football. All in all, a draw was a fair result, though Alty will rue a header against the post by Thornley in the first half and a clearance off the line from the same player but Scarborough can point to a couple of goals ruled out for offside and plenty of second half pressure. Alty picked up more injuries; Potts limped off at half time, Maddox went off with a hamstring injury and Olsen also hobbled off in the second half. Val Owen was the Alty Man of the Match. Alty had not dropped even a point at home to Scarborough in nine previous Conference/Alliance encounters but both sides arrived at this game after defeats last Saturday. In Alty's case, they were trying to put behind them two successive 5-0 defeats to top six teams. Manager Graham Heathcote rang the changes both as a reaction to recent results and because part-time Altrincham are playing four matches in a ten-day period against full-time opposition. The magnitude of Alty's task this season was shown by the fact that tonight's opposition, Scarborough, though not normally bracketed with the division's big spenders, have a weekly playing budget more than six times that at Graham Heathcote's disposal. Gary Talbot, Colin Potts, Lewis Chalmers and reserve keeper Richard Acton were all ruled out with recent injuries but Alty also remained without the recovering Eddie Hussin, Gary Scott, Steve Aspinall, Lutel James, Kieran Lugsden and Richard Norris. Into the starting line-up came the less than fit Colin Potts, George Melling, James Olsen and Rod Thornley in place of Stephen Rose, Nehru McKenzie, Kirk Hilton and Karl Munroe, who had all started at York last Saturday. Indeed, McKenzie and last Saturday's sub, Gary Williams, were not even in tonight's 16 as the management rotated its squad during this tough ten-day period. Lee Hendley remained on the bench but for the first time this season Alty started with no cover goalkeeper for Stuart Coburn. There was a welcome return to the bench after injury for Kieran Lugsden. Positionally, Steve Hawes moved to right-back in place of Munroe, whilst Melling's inclusion at centre-back was prompted by Band's move forward to midfield. Rod Thornley's first start of the season meant that Alty started with a 4-4-2 formation. It was good to see the injured Marcus Hallows involved in taking the drinks to the Alty bench before the match. His fellow injury-victims Gary Scott and Eddie Hussin were also in evidence, with Gary taking part in the warm-up. Scarborough were without strikers Quayle and Wake, through injury. So, Clark accompanied Speight up front, whilst Eccles (from Gretna), veteran Neil Redfearn, captain Neal Bishop and Tony Hackworth populated midfield. The back four comprised Nicholson, Baker, Foot and Elebert. ALTRINCHAM (Red & white striped shirts, black shorts, red socks) : 1. Stuart COBURN, 12. Steve HAWES, 24. George MELLING, 4. Mark MADDOX (capt. ), 13. Chris ADAMS; 7. Colin POTTS, 5. Peter BAND, 8. Val OWEN, 16. James OLSEN; 9. Colin LITTLE, 10. Rod THORNLEY. Subs: 17. Karl MUNROE, 20. Kieran LUGSDEN, 21. Stephen ROSE, 23. Kirk HILTON, 26. Lee HENDLEY. SCARBOROUGH (All blue, with red trim on shirts): 1. Leigh WALKER; 2. Dave ELEBERT, 5. Paul FOOT, 14. Steve BAKER, 3. Kevin NICHOLSON; 7. Tony HACKWORTH, 8. Neal BISHOP (capt. ), 4. Neil REDFEARN, 25. Mark ECCLES; 11. Ian CLARK, 10. Jake SPEIGHT. Subs: 6. Simon WEAVER, 12. Ashley LYTH, 22. Michael COULSON, 24. Ryan BLOTT, 30. Antoni PECORA. Unusually, Alty ran out to the Golf Road End as the teams emerged from the tunnel on a pleasant, dry evening at Moss Lane. But the kick-off was delayed for four minutes when the linesman, inspecting the goal, found that the Golf Road net was not adequately secured to the cross bar. Kitman Charles Heathcote emerged with some tape and, hoisted on keeper Stuart Coburn's shoulders, he taped the net to the cross bar. Rather than use the delay to sort out the toss, the referee waited to complete these formalities and eventually Alty kicked off towards the away fans at the 20/20 End, with Danny Adams, Huddersfield Town's former Alty-let back, one of the modest crowd of 862. Scarborough had two successive early throw-ins and the second one led to a stab over his own bar by an Alty defender, at the cost of a corner on the visitors' left (3 mins). The Golf Road was responding well to manager Graham Heathcote's call for vocal support. But an early error by the Scarborough defence allowed Little a clear shot from 15 yards but he uncharacteristically put his shot wide of the target (5 mins). The early play was a bit scrappy but Alty had their second good chance of the game after just 8 minutes. It came when Rod Thornley, as ever chasing after a potential lost cause, got to the by-line and panicked keeper Walker into a bizarre hook over his own back towards his own net from left of his goal. Thornley reacted quickly and directed the ball further towards the net only for a defender to clear off the line. But, overall, manager Heathcote was not happy, telling his charges that they were giving the ball away too cheaply. Following a trip by Maddox, Redfearn sent a freekick form 25 yards well wide of the goal. Scarborough soon won another freekick as Maddox fouled Clark and earned a lecture from referee Hendley. Alty then went close for the third time when Little fed Olsen on the left and his excellent cross located Thornley at the back post, only for the striker's header to come back off the far upright and then be cleared for a corner (15 mins). For Scarborough, Speight was looking lively as was the blond Clark, the former Darlington man who played against Alty in the FA Cup in 2001. Potts, who had been subdued on the Alty right, now took time out to change his boots and almost instantly produced a piece of magic as he jinked past an opponent only to be scythed down, to win a freekick on the front, right edge of the penalty area. (21 mins). This was cleared and soon Melling was forced to concede the third corner of the match to Scarborough. But Thornley then did well to get forward on the left but his cross found no colleague on its end. Compared with our recent reverses against Degenham and York, it was becoming apparent that these two sides were fairly evenly matched. However, no clear chances emerged over the next few minutes until Speight advanced on the left and, though Melling did well to intercept, the lose ball ran to Hackworth, who shot wide (32 mins). Following a kick clear by Coburn, Band did well to find Owen who, in turn located Little but he delayed slightly too long and only a Scarborough goal kick resulted. Soon afterwards a neat Alty move led to a throw-in from which Little failed to gather Hawes's throw. A foul by former Gretna man, Eccles, on Band earned the Seadog the first booking of the match, a little harshly (36 mins). From Hawes's resulting freekick, a Scarborough head conceded a corner. Olsen’s corner was cleared to Hawes, who won another flag-kick. This came to nothing and the visitors soon won their fourth corner of the game, followed instantly by two more, both of which were cleared However, Scarborough had the ball in the net soon afterwards when Speight volleyed home a pass from Clark off the crossbar - but he was ruled offside (41 mins). As half-time approached, Potts was clearly limping as the gamble on his fitness appeared to have backfired. Little then got in a low snap-shot which former Stalybridge keeper Walker saved competently, low down (44 mins). Next, a ball forward from the visitors was left by Melling and this allowed Speight to feed Redfearn but Coburn produced a fine save and Val Owen cleared up the loose ball (45 mins). But Alty themselves soon threatened as Little did well to find Thornley but his cross failed to locate Band from the left. In added time, Clark fired a shot well wide so the half ended goalless with Alty now more than six hours without a league goal. At the break, Potts had to give way and Munroe was brought on at right-back, meaning that Hawes had to move to midfield. Scarborough started the second half strongly and, after a foul by Adams on Clark, Hackworth shot just over the bar (47 mins). A freekick from Foot's push on Thornley came and went before Scarborough earned their seventh corner of the night. Soon after this, a fine clearing header from Maddox, near halfway, saw the Alty captain collapse with what appeared to be a pulled right hamstring. Before play was stopped to treat him, a low cross from Clark came off Munroe, who inadvertently directed it towards his own goal, but Coburn gathered the ball safely. After treatment, Maddox hobbled off to join the Alty injured. As play resumed, manager Heathcote exhorted Steve Hawes to "Get some life into them", meaning his team-mates. Kieran Lugsden came on for Maddox, and unusually took up the right berth in midfield (52 mins). Hawes now reverted to right-back as Munroe joined Band in central defence. But Scarborough soon won another corner, off Adams. A few minutes later, Speight fed Clark for a shot which Coburn blocked well only for Clark to put the rebound wide from the left (56 mins). "Stop giving the ball away so easily", Graham Heathcote instructed his team as the visitors continued in the ascendancy. But then, against the run of play, Alty took the lead. It came after Coburn came out to chest the ball away. A long clearance followed which was nodded on for Little, who was timing his run well. His first shot hit the advancing keeper but, from the rebound, Little scored his third goal of the season (58 mins). Soon after this, Scarborough again had the ball in the net but this was once more ruled offside. The "goal" came when Coburn parried out Redfearn's shot and Speight put the loose ball into the net (61 mins). Scarborough now made a change, bringing on teenager Coulson in place of Eccles (63 mins). Soon, Lugsden did well for Alty on the right, getting into the box and forcing a good save from Walker, which gave Alty a corner. This was cleared but, soon, Lugsden advanced on goal again but this time only sent an underpowered left-foot shot at Walker (66 mins). But Scarborough threatened again when Adams lost the ball to Foot which led to Speight's cross from the right corner which was nodded just wide by a team-mate. Kirk Hilton had been preparing to come on but now put his track suit top back on (69 mins). Moments later Olsen found Little, who was fouled in the act of shooting, earning a booking for Bishop (69 mins). A rehearsed Alty freekick did not work and Scarborough went to the other end where Coulson set Speight free and on-side but Coburn blocked well and the loose ball was then fired over the bar (71 mins). Scarborough continued to press despite a shot from Lugsden which cleared the Golf Road roof at the other end. Eventually Hilton came on for the limping Olsen at the same time as Lyth replaced Hackworth for the visitors (76 mins). Melling was soon flattened by Coulson's late challenge and needed treatment. Alty continued to hold out and almost sewed up the game when Hawes found Little who lifted the ball over the advancing keeper, but it was just deflected wide by a defender's intervention for a corner to Alty. After this had been cleared, Lugsden was harshly booked and then another Scarborough youngster, 17 year-old Blott came on as a substitute (83 mins). Alty were now sitting very deep and as Clark found Bishop, the Scarborough captain was in yards of space some 30 yards out. The ball then came to Speight who crashed a superb shot from 25 yards off the cross bar. With Coburn prostrate, Coulson rushed in for the kill. The youngster delayed any shot till Coburn had got to his feet but managed to get the ball into the net for the equaliser (86 mins). Disappointing though it was for Alty, few could deny that Scarborough deserved the leveller. Play now went into three minutes of added time. During this period, Little did well and found Thornley to his left but just as he was in the act of shooting, a great tackle blocked his effort at the cost of a corner. From this, Band rose well but headed over the bar. But soon another Alty corner arrived after a slice by Foot. Hilton's corner again found Band but he could not direct his header into the net. Both sides went close in the third minute of added time. Firstly, a foul on Munroe in turn led to another freekick when Thornley was pushed over. From 28 yards out on the right, Hilton hammered a freekick at goal which Walker did well to punch clear off his line. But immediately Scarborough sent a ball up the middle and Coulson was left in the clear against Coburn. Tthe Alty keeper stood his ground and forced the youngster to shoot at him to save the day for the Robins. To have conceded a goal at that stage would have been heartbreaking. 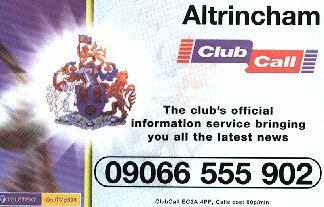 This was a generally entertaining game which saw Alty re-establish their Conference credentials, after two heavy defeats, by matching a full-time side over 90 minutes. Val Owen was named Man of the Match as Alty consolidated their position in mid-table. Injuries to Maddox, Potts and Olsen look likely to rule out the first two named at Cambridge on Saturday.